A clean, safe, and efficient campus is what enables Head, Heart, Hands learning. Room Requests are available to reserve space at LWHS for parent, student, faculty/staff, and partner organization events or meetings. The request form is located on the resource board. Maintenance Requests can be placed to initiate work requests related to carpentry, electrical, plumbing, general repairs, etc. The request form is located on the resource board. Parking Lot Management for Faculty and Staff. More information is located on the resource board. Directions to the LWHS campus are located on the Contact page. In the facilities department, we are proud of the LWHS campus and are always looking for new ways to ensure that the buildings, operating systems, grounds, and overall environment contribute to a comfortable and safe learning space. We are committed to recycling paper, plastic, cans, bottles, and cardboard, as well as light bulbs and batteries. Compost bins are in the kitchen, cafeteria, and faculty lounge. Food service centers around seasonal, healthy food that is organic when possible. Plastic utensils are no longer being used. Bottled water consumption has been reduced. School events are using recycled or biodegradable materials. Light fixtures have been changed to more energy efficient T-8 digital ballasts and incandescent bulbs are being replaced with fluorescent ones. Maintenance closets, elevators, equipment rooms, deep sink rooms, and bathrooms have been switched over to "occupancy detectors" so lights will not be left on. Bathrooms have motion-activated lights. School communications are going electronic and printed publications are on recycled and FSC-certified paper, using soy-based inks. Student updates, advising announcements and attendance are all electronic. Faculty are reducing paper handouts by using email and PDF files. A number of departments are using two-sided printers and double-sided copiers. The library resuses paper as scratch paper. 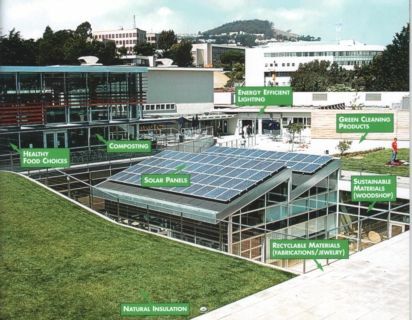 Architecture classes teach green building design and practices, and the shops are incorporating eco-design and recycling/reuse principles in the curriculum. Additionally, the shops recycle scraps and use eco-friendly materials. Obsolete hardware is sent to recycling centers and old tools in the shops are donated to other organizations. The facilities and maintenance department uses green janitorial products (which has the added advantage of being beneficial for allergy sufferers) and reusable cloth towels that are washed on the premises. We provide green seal certified paper products (100% recycled, de-inked without solvents/chlorine or other chemicals, no bleach, pigments, dyes, fragrance or softeners) for toilet paper and paper towels in our bathrooms. The towel dispensers are hands-free (no levers or batteries). Foam soap is pre-measured for washing hands and Purell dispensers are outside all the bathrooms. All restrooms are shorter flushing and water friendly. Shower heads and sink faucet heads are aerated to cut back on water flow. The shops, Howth Street buildings, and science building bathrooms use instantaneous water heaters to save energy. The solar panels generate enough electricity to run 85 computers, which are are set to go to sleep after a short period of time. See a graph of the energy output tracking the solar panels daily. If you have any questions filling out this form, please contact Facilities Manager Terry Eckhart. The Facilities Department will follow up directly with you about your request. If you are not contacted within 48 hours, please contact Facilities Manager Terry Eckhart. Please note that submitting a request does not mean automatic approval. Facilities Management reviews and approves requests based on availability of space and appropriateness of the request. Event and/or Room Requests submitted any other way will NOT be considered. We don’t process requests between April 15–August 15. If you submitted the form between these dates, you can expect a response in early September. The Facilities Office is open Monday 7:30am–4:30pm and Tuesday–Friday 7am–4pm.